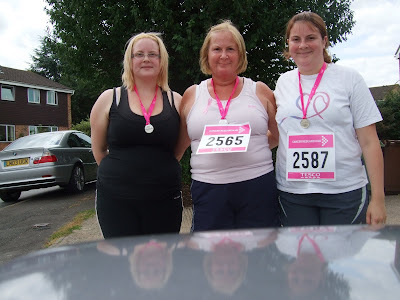 I'm very pleased to be able to report that the Boucher girls and honorary Boucher (myself - having given up the name a little over 2 years ago), all completed the Race For Life on 5th July 2009 with no mishaps and in reverse order of the race 2 years ago! It was great to be amongst all those wonderful people again who feel so passionately about 'doing' something for a good cause and despite a poor weather outlook - morale was high and the atmosphere really supportive. We're slowly coming to the conclusion that we like doing the race every two years so 2011 - look out!